in keeping with our objective of getting and staying healthy, kai has teamed up with author and recipe developer gina homolka of skinnytaste.com. busy, married mom of two girls, gina's food philosophy is "to eat seasonal, clean, whole foods and maintain good portion control." easy to follow and super tasty, gina's recipes have taken the guess work out of meal time. sounds good to me. i'm planning on making her cacio e pepe this weekend! great food without the guilt. it can be done! gina's best recipe, hands down? "exercise + a well balanced diet + good sleep = a happy life." cacio e pepe means “cheese and pepper” in italian. 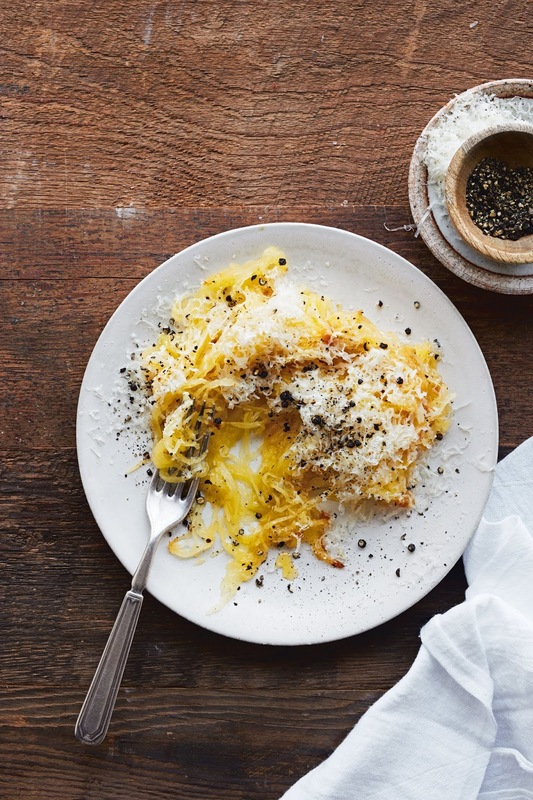 those are two of the five ingredients in this super simple dish, which traditionally involves tossing pasta with olive oil, pecorino romano cheese, and plenty of black pepper. i’ve made it low-carb and lighter by swapping out the pasta for spaghetti squash. fast, simple, and delicious. preheat the oven to 400°F. line an 18 x 13-inch rimmed sheet pan with foil. halve the squash lengthwise and use a spoon to scrape out the seeds and stringy yellow strands, then discard. season the flesh with a pinch of salt and pepper to taste and place the squash cut side down on the prepared pan. using a fork, scrape out the squash flesh into a bowl; it will separate into spaghetti-like strands.add the olive oil, pecorino romano, and 1⁄2 teaspoon pepper. toss well and serve immediately. thank you so much, gina! xo. reprinted from skinnytaste one & done. copyright © 2018 by gina homolka. photographs copyright © 2018 by eva kolenko. published by clarkson potter, an imprint of penguin random house, llc. Is the number of calories correct for 1 serving?